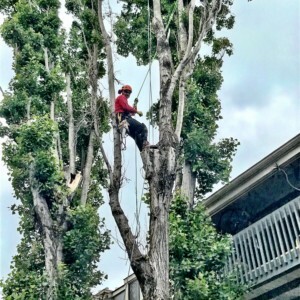 As a climbing Arborist, one of my most frequently asked questions is, "How do you get up into the tree?" Well, take a seat and let me tell you a tale. Ever since the caveman climbed trees to get at the high-hanging fruit, tree climbing is the quintessential part of urban forestry. We have gone from climbing on hanging vines Tarzan-style to using high tech synthetic rope. Some ropes such as the Armor Prus have Kevlar cores! The traditional Double Rope Technique (DdRT) has been the go-to method for the last 100 years here in the US and overseas in the UK. It is a simple system, and even kids can use it during Arbor Day. Any climbing Arborist can climb up a tree using the MRS with minimal gear. In fact, the A Plus apprentice climbers are required to tie a complete MRS blindfolded with nothing more than one carabiner and a rope! However, the MRS heavily relies on upper body strength and endurance. The climber has to lean back to pull the rope using the arms and core muscles. Thus MRS is not ideal for climbing more than about 50 feet. Back in the day, tree workers tied themselves directly to their ropes. This was before ergonomically designed harness were common place in the industry. According to the 1979 ANSI Z133 Safety Standards, tree workers may secure themselves with two loops using the Double Bowline on a Bight knot instead of a padded harness. Imagine sitting on a rough 1/2 inch Manila rope all day long getting your bottom calloused! Despite its shortcomings, the MRS is here to stay. It can be as simple or as complex as you want it. And there are ways to make MRS more ergonomic and efficient. Next time, we'll talk about the alter ego of MRS which is the Single Rope Technique (SRT).